Update: This article originally had 7 climbs but I have visited a few more places since it was first published in 2013. 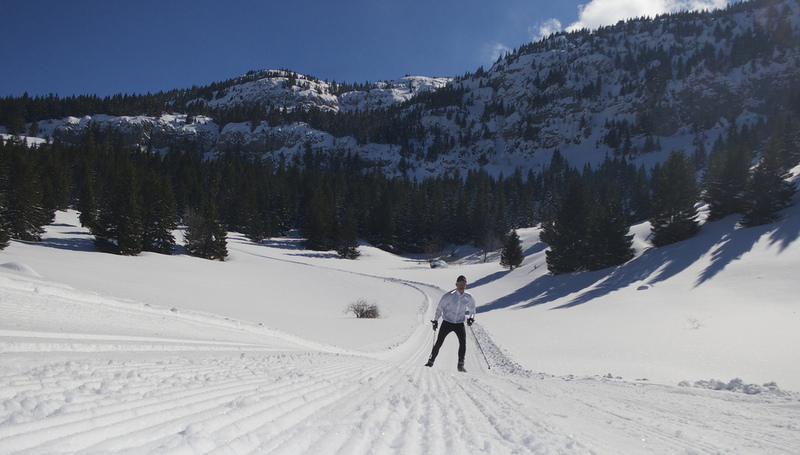 Nordic (Cross Country) Skate Skiing may be the perfect work-out. Not surprisingly, near Geneva many of the best locations are at the top of interesting cycling climbs. It’s been a cold, snow-filled, fantastic winter so far. 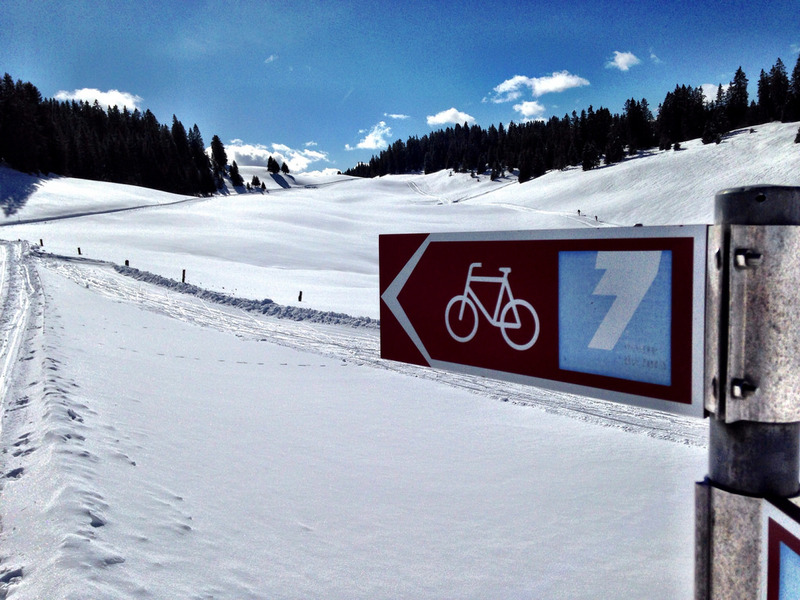 And while I have a fairly good track record of doing freezing, icy, snowy, silly winter cycling climbs …. this winter I decided to focus on cross country skiing for a change. I purchased a Rhône-Alpes Region Nordic Skiing Season Pass and it has been getting good use (link to the official Rhône-Alps Nordic Skiing web site and all 83 locations). Here are fourteen tough cycling climbs with great skate-skiing at the summit in winter – all within an hour of Geneva (see map below for locations). Feel free to suggest any I may have forgotten. The Morzine side of this famous cycling climb is used as a ski slope in winter and thus closed until May. 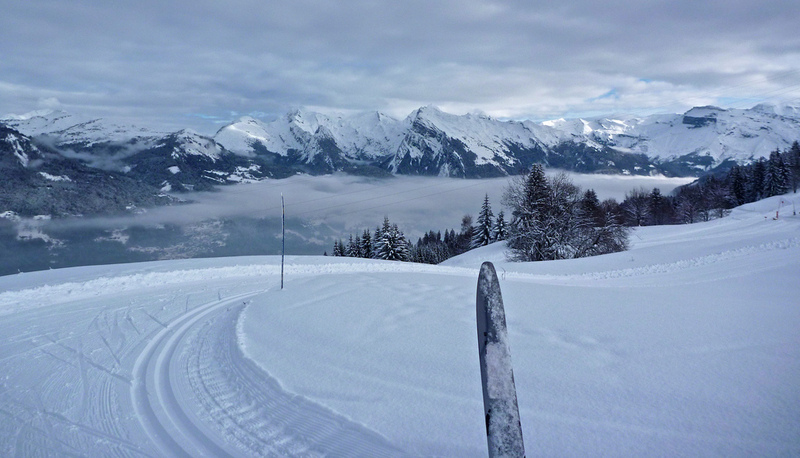 But when the weather gets warm and the cross country ski trails in the valley close, they occasionally open the road to Joux Plane from the more famous Samoëns side. This also means the road is “open” for bikes (leave the road bike at home). Here is a post where I cycled up to Joux Plane and rented XC skis at the Col.
My favourite location. Two challenging black / red routes surrounded by mountains and next to the Monument National de la Resistance. It’s a great cycling climb (both sides) – see here. 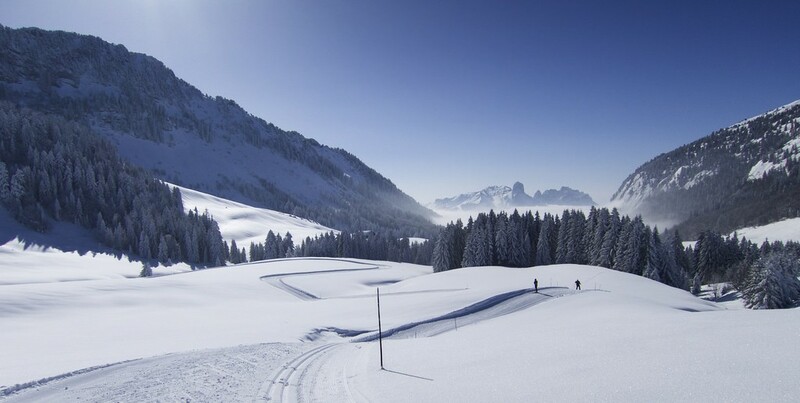 At 1844 metres, Col de Pierre Carrée is the highest paved mountain pass open all year near Geneva – servicing Flaine ski station. Many nearby lower passes (eg. Col de la Colombière at 1613 metres) are closed for 6 months or so. At the Col itself, on the little golf course, is a small but very scenic Cross Country Ski centre. It’s a superb 21 kilometre cycling climb too: details here. More than 100 kms of trails at all difficulty levels. Half the trails on a high, beautiful plateau, and the other half through mountain forests – leading to a fabulous Mont Blanc lookout. La Vattay is near Col de la Faucille, but the trails pass a little known, very challenging paved climb: Col de la Vattay (also known as Col de Combe Blanche). Cycling details here. Col de la Croix Fry is one of my very favourite winter cycling climbs, details here. 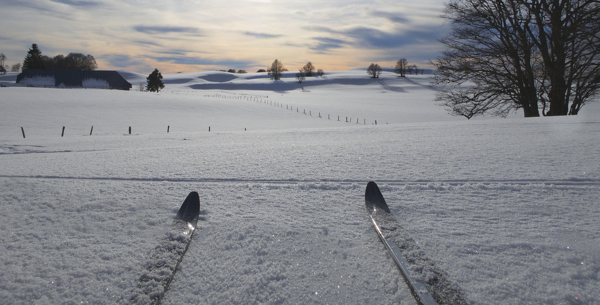 With 150 kilometres of trails, Savoie Grand Revard nordic ski centre is huge. It has plenty of trails of all difficulties – almost endless challenges. High above Lac du Bourget, Mont Revard also appeared in the 2013 Tour de France. Climb details here and here. 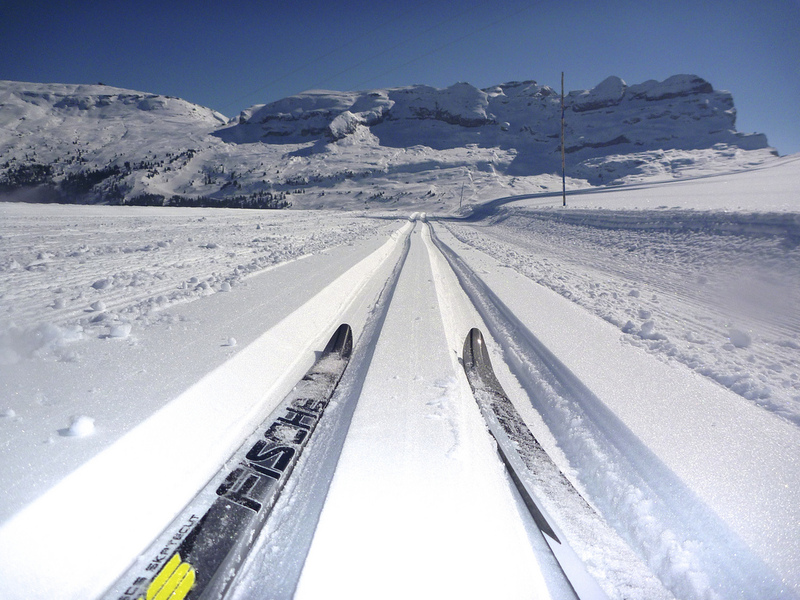 A few kilometres above La Clusaz ski station in the Aravis alps is the well situated Les Confins nordic ski centre. Take the black trail up to some fabulous views (photo above). Les Confins also has a very difficult trail linking it to Le Grand Bornand below – which also has a biathlon track and some nice trails. Col des Confins is a steepish 6 km cycling climb that can be combined with some of its more famous neighbours such as Col de la Colombière, Col des Aravis or — see here — Col de la Croix Fry. In the Jura mountains above Bellegarde, Plateau de Retord has more than 100 kms of trails of all difficulty levels. The main entrance is at Col du Cuvéry, a medium sized, quiet cycling climb that can be combined with other nearby cols for some fantastic cycling. Examples here. Praz de Lys ski station has cross country ski trails that allow skate-skiing up to Col de la Ramaz from either side (Sommand or Savolière). Surrounded by high mountains, it is a perfect location. Le Semnoz is the mountain on the west side of beautiful Lake Annecy. It’s the highest road-bike cycling climb in the area. 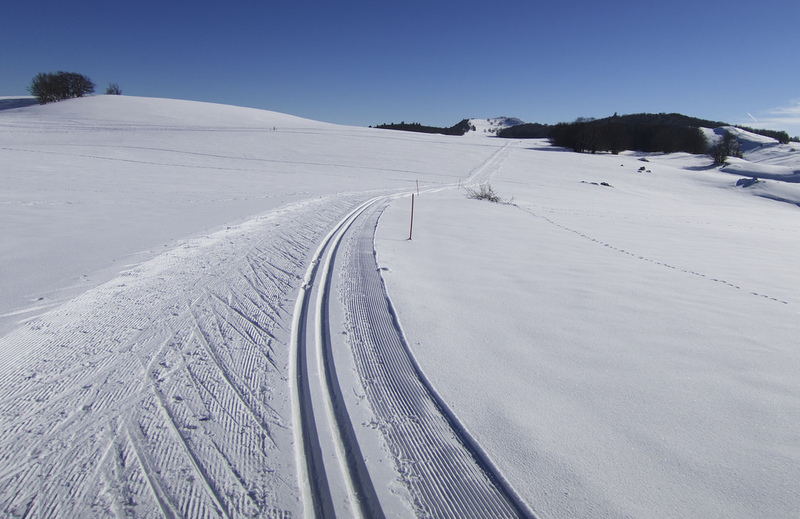 Here is a post where I cycled up and rented cross country skis at the summit. And here is a post describing 5 cycling routes to the summit. This is a seriously steep 13 km cycling climb on the north edge of the French Alps. It’s never been in the Tour de France but did host a mountain top finish in the 2014 Tour d’Avenir. Cycling details here. Thanks to Chris (see comments), I have now added this Swiss Jura station. A beautiful trail links all the way to Marchairuz. There is an entrance to the pistes at either end. Not tooooo hilly, this was my longest session ever – testing my mediocre skating technique. At the end of a steep little road above Col de Chatillon sur Cluse, the Cross-country ski centre of Agy is perched on a ridge at about 1300 metres with views of the Alps in 3 directions. Sur Lysand. Col de Grand Colombier just over peak in distance. In the same Jura massif as the 4 amazing routes up the formidable Grand Colombier is the scenic little cross-country centre Sur Lysand. In fact, the trail-head is most of the way up the also very steep road to Col de la Biche. 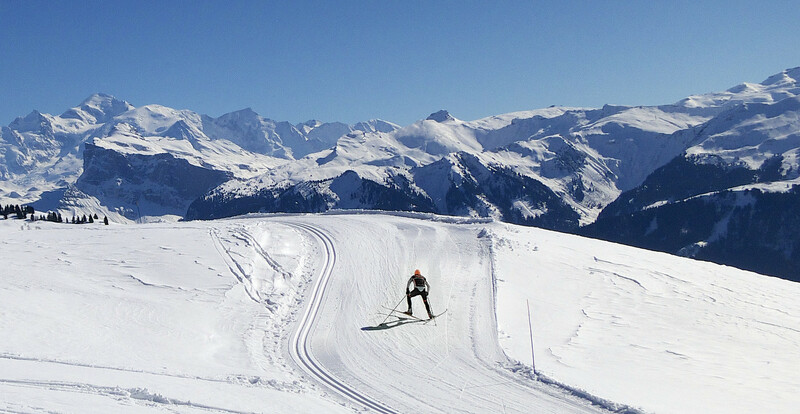 The Cross country skiing gets as high but a little short of the Col, but does a loop around Croix de Fanban with great views of the Alps in the distance. Cycling details here. The map below includes the above fourteen locations and a few more in the region. Great stuff Will. Love the blog and good to see you on Strava too. 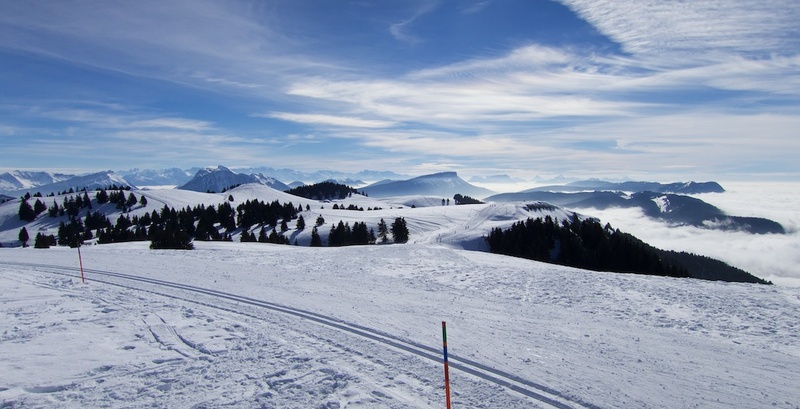 You’ve left out Col de Joux Plane, which has some nice skate skiing runs, and plateau de Plaine Joux in the Massif des Brasses, which is a great cycling climb from three sides (Viuz, Onnion and Villard). Pretty sure we can come up with more… Stay wax / rubber-side down and enjoy the season! SdP. I’ll try and visit Plaine Joux – I don’t know it. Another high, local Ski de Fond location is at the Flaine Golf course – exactly beside Col de Pierre Carrée at 1844 metres. Very nice, if small. Une autre destination sympa dans le Jura à essayer bien que un peu plus loin que la Vattay: le secteur des “Hautes Combes”. Tu te gares par exemple à la Pesse, puis tu peux faire une belle boucle via le col du Merle > Bellecombe > Les Molunes > Les Moussières. Une sacré boucle parmi d’autres possibles (plus de 200km de pistes). You’re right Will, and indeed Joux Plane is closed for xcountry skiing at the moment since the runs down in Samoens and all the way to Sixt are open. 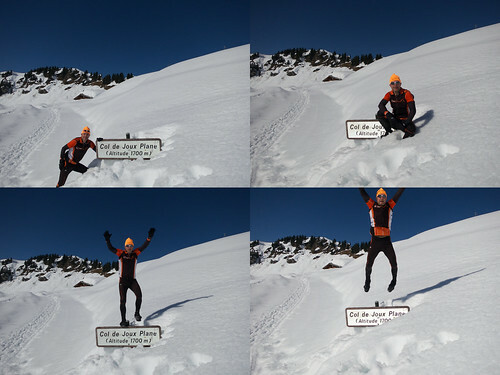 I think they open it once it starts to melt down in the valley, so should be any day now… Another nice local one I visited recently is the Col des Moises, which has 20kms or so of fairly gentle xcountry skiing, and a run which links to the Col du Feu. Both good Vallée Verte cycling climbs. La Pierre Carrée is a nice one too, and there’s also Agy just above St Sigismond which is sort of on that cycling climb if you take it from the Col de Chatillon. So much more skating to squeeze in before the season is out! I’ve cycled by Moises when there is snow, but never tried the XC skiing – thx for the idea. Will, for someone who lives in Switzerland, you forget about the Swiss options far too often, there are NONE listed here! Col de la Givrine would be the closest to you, and has some nice ski trails and ski rental (cycling up via Arzier is a lot quieter than is the main road up from Nyon), and you can also access trails from the other cols that go over the same ridge: Col du Marchairuz and Mollendruz, but there is no ski rental there. All of these are open from both sides year-round. If you continue down to the Vallee du Joux on the other side then there are lots more ski trails that start from various villages, plus many restaurants to warm up in, and somewhere must do ski rentals. In the Swiss Alps, the nearest would be Col des Mosses, which has excellent XC skiing and is a nice climb to cycle if coming from the north side, which I did yesterday :), but a bit too busy from the SW (Aigle) side, so I normally descend down that side. Keep having fun on the bike and skis! Ha, yes you are right. My only excuse, for the last several years we live in Haute Savoie, just a couple of kms over the border from Genève. I’m pleased that you’ve added Col de la Givrine, thanks 🙂 I hadn’t realized that you’re on the French side of the border, sorry. 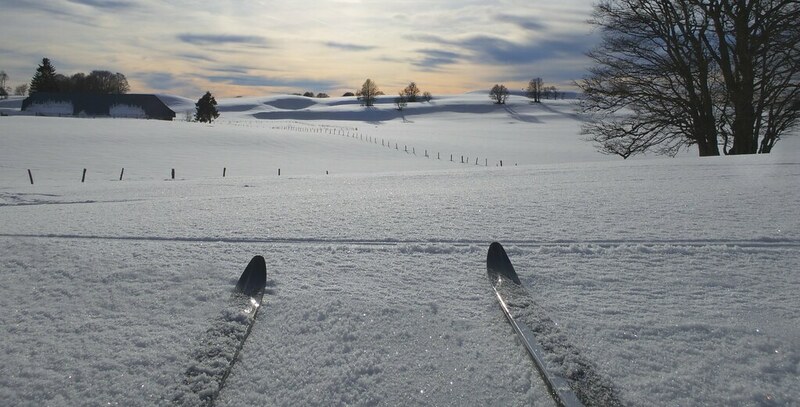 I should also correct my previous comment where I said that there is no ski rental at Col du Mollendruz – my wife was there last weekend and reported that you can definitely rent XC skis at the top of the col where the trails start. I once skied from the train station at La Givrine, past Marchairuz, and all the way to Mollendruz. There’s no ski trail down from Mollendruz to Le Pont (in Vallée du Joux), but I was able to ski some those last few kms on a hiking trail and walk the rest to get to the train station in Le Pont. A tiring but great day – I far prefer that type of outing than driving a car somewhere and skiing around in circles for an hour or two.